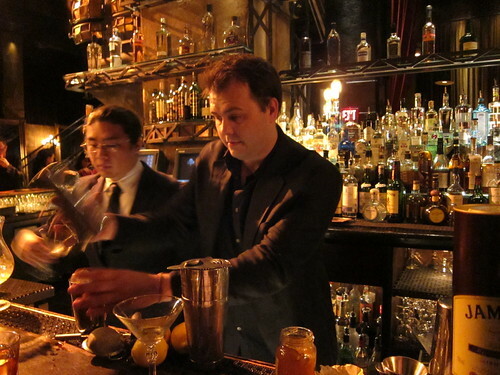 35 cent cocktails are back at The Edison, quite possibly the best happy hour deal in town! Better yet, they're now available on both Wednesdays and Thursdays from 5-7 PM, while you can get a $1 Millenium Cocktail on Fridays at the same times. 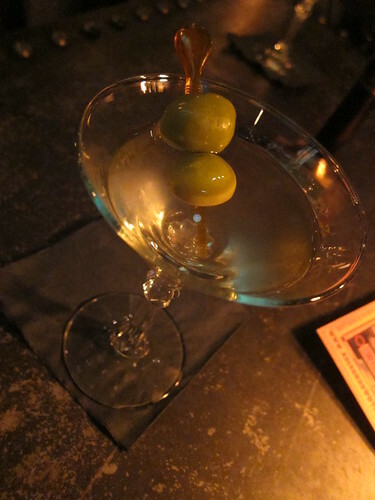 The 35¢ cocktail changes all the time, but expect competently prepared classics like this gin martini we had last week. Five bar snacks are available for $5 each from 5-7 pm also and each comes with either Edison or Tesla (sweet potato) fries. 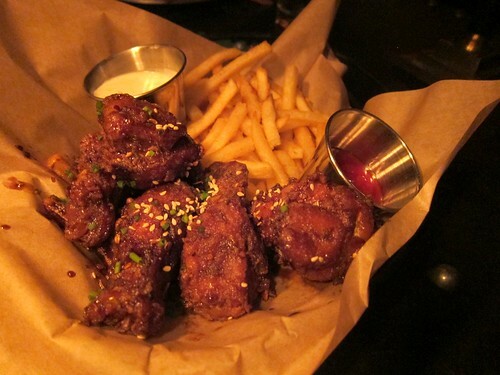 Singapore Wings, with a sweet glaze. 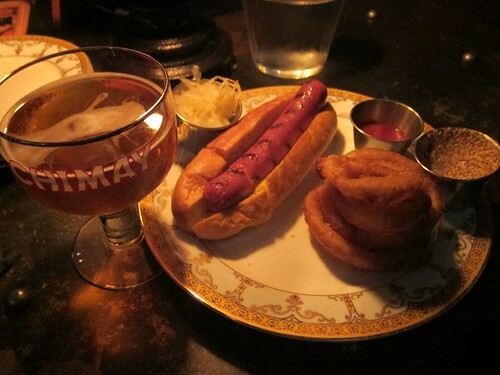 Beer drinkers should watch out for the "Dog Days of Summer" deal, where you can get (kosher) hot dog, onion rings, and a draft beer for $10. If you get a glass of Chimay cing cent like I did, consider that that usually runs $9 a glass here. That means your hot dog + onion rings come out to $1. If one cocktail isn't enough (when is it ever? 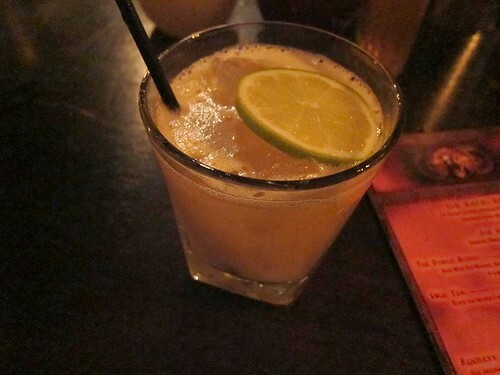 ), be happy to know that everything else on the menu is 40% off during happy hour, so you can give my favorite the Brown Derby, a concoction of bourbon, honey, and grapefruit juice, a try. PS. 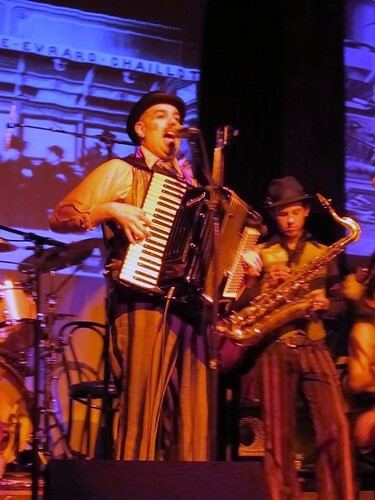 Radio Room is returning to The Edison on Tuesday July 13. 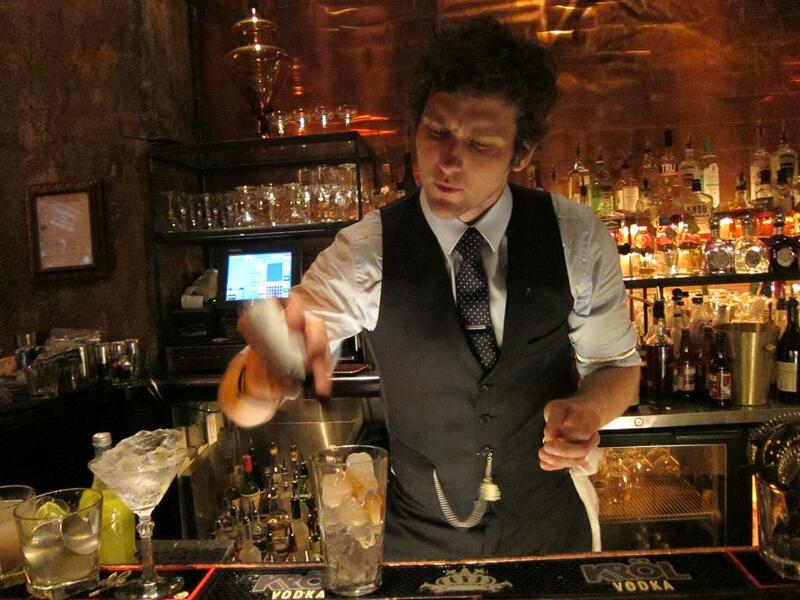 This time they're featuring bartenders from Ward III in New York: Michael Neff, Kenneth McCoy, and Abdul Tabini. Event starts at 8 PM with a $10 cover. Check out www.edisondowntown.com for pre-sale tickets so you don't have to wait in line! Disclaimer: I was hosted by The Edison during this happy hour. Balblair scotch distillery has been around since 1790 but the name is fairly new to the American audience. Two of their products have finally made their way into the American market. They claim to be the only distillery which bottles their scotch in vintages, just like wine. 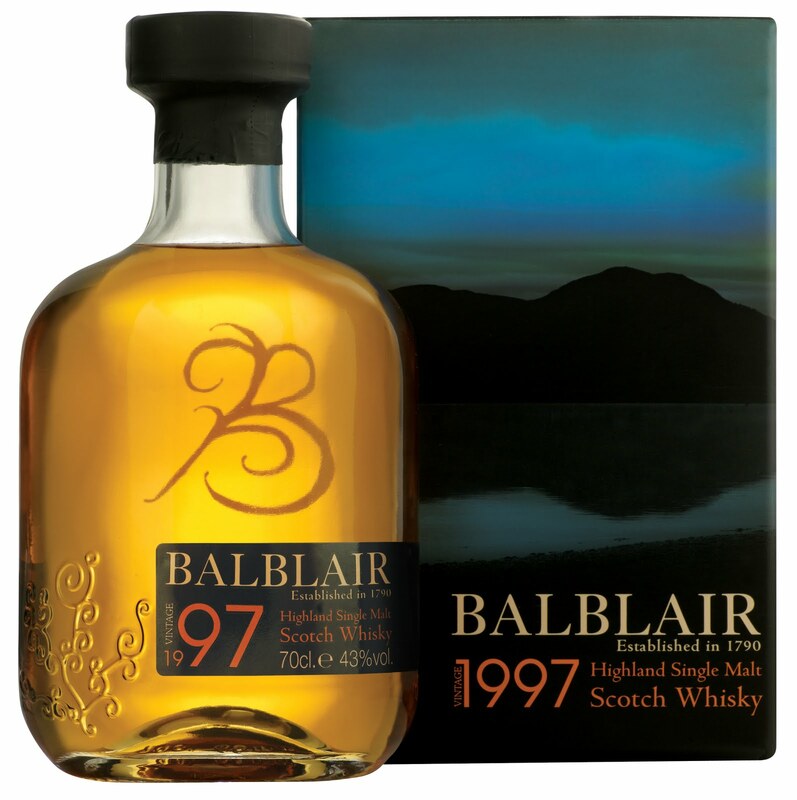 Balblair 1991 ($129.99) and Balblair 1997 ($64.99) are the first two vintages that are available for purchase in the U.S. Distillery Manager John MacDonald handpicks the casks that he deems to have reached the peak of maturation each year and releases them as the single malt vintages. 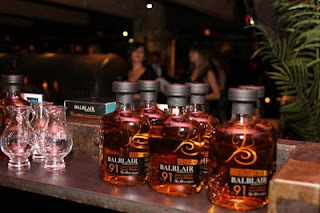 To introduce these two vintages, Balblair recently invited some media and scotch lovers to a tasting party at The Edison (the ambiance there is a perfect fit with the bottle's design), where I sipped scotch and ate bruschetta with other bloggers and members of the LA Scotch club. I started the night out big with the 1991. Balblair 1991 just received a rating of “Excellent Highly Recommend” in the Ultimate Spirits Challenge. Reminds me a bit of butterscotch and has a smooth and long finish. 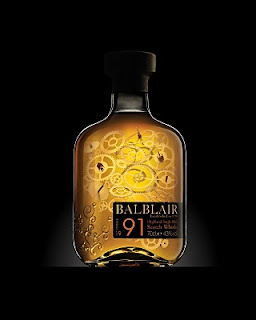 The Balblair 1997, on the other hand, is spicier, has more bite but not as smooth and the finish isn't as long. I personally prefer the smoother 1991, but the characteristics of the two bottles are quite distinct and worth separate considerations. By the way, the gorgeous picture on the gift box is supposed to be a hill behind the distillery. Makes you want to go visit, doesn't it? Dark chocolate and scotch? Yes, please. I will definitely keep that in mind next time I pop open my bottle of scotch. *Photos courtesy of Balblair, bcs they look so much nicer than the ones I took. A Tuesday Night Debauchery. Radio Room at The Edison. 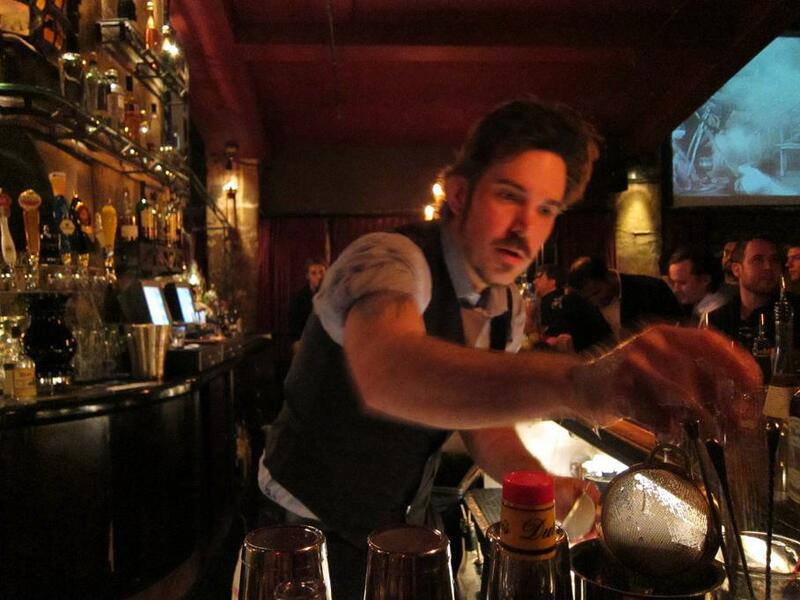 Once a month on a Tuesday, The Edison brings in talented bartenders from around the nation for a one-night mayhem called The Radio Room. 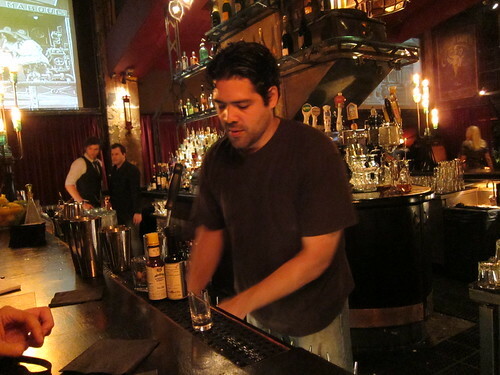 Set in LA's first power plant, the speakeasy feel of The Edison comes naturally. I had been to their Tuesday "speakeasy" nights a long time ago, when it was small and only held in one of the rooms. Now Radio Room goes big. 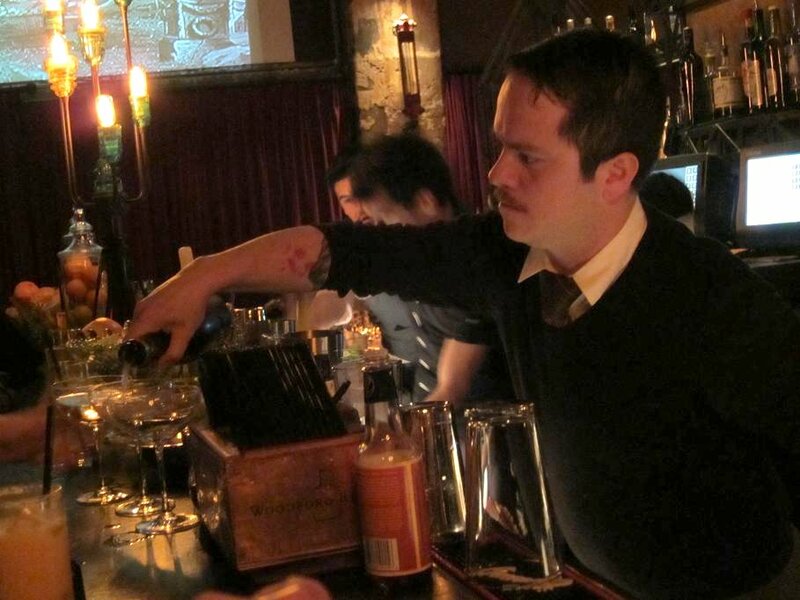 Last month Radio Room returned to The Edison and featuring their new Director of Spirits Joe Brooke (formerly from Copa D'Oro), Brian Miller from Death & Co in New York, and Erick Castro from Rickhouse bar in San Francisco. Probably thanks to the Tasting Table coverage of the event that morning, the place got packed as the night goes on, so for the next one either come early or come really late to avoid the lines! We got there somewhat early and managed to score a side room to ourselves along with fellow bloggers I bumped into there. 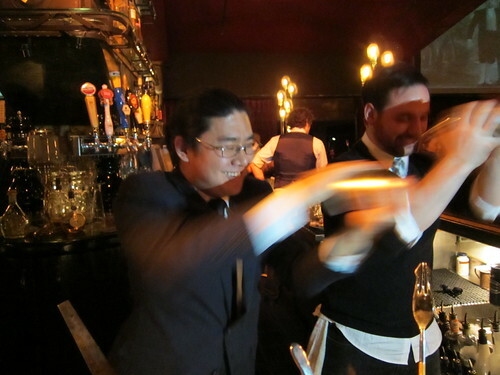 Each of the three bartenders featured three special drinks each. I hit up Brian Miller's from Death & Co station first. 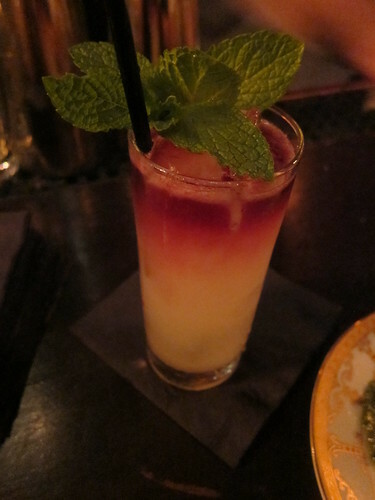 The first drink I had that night became my favorite: Hispaniola from Brian Miller featured rum, Summer Royale tea, lime, ginger, and syrup. Not that I tried every single special drink that night. They did have 3x3=9 drinks to try! I also enjoyed Sancho's Lady from Erick Castro. The wait to order a drink did get really long later that night, what with people going up to these guest bartenders and asking for a gin and tonic and all. Not to worry for next time, though, The Edison promises to bring even more bartenders and also "satellite bars" where their regular employees will man for those of you who want to just order a hi-ball, a beer or whatnot. That will certainly free up more of the time and hands of the renowned guest bartenders to make their own special, complicated drinks. They also had live music from The Vagabond Opera. I didn't pay much attention the them until I hear Scott Walker's Amsterdam playing (at which point I immediately rushed close to the stage). All is great if I can hear some Scott Walker! Somewhat hidden in the back are gems from the sea. 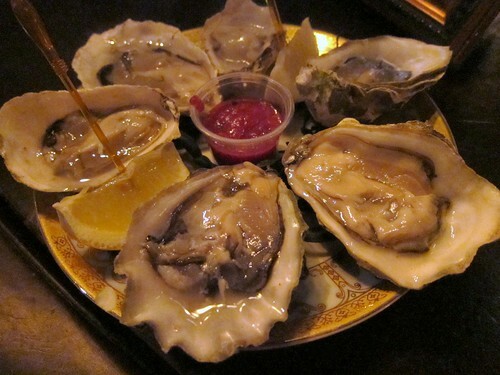 Christophe Happillon was shucking away some Fanny Bay oysters. 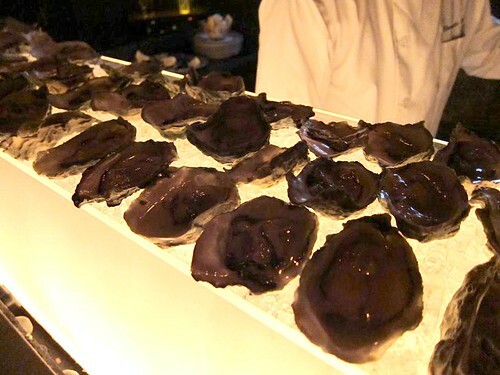 I tasted one and - wow - amazing oysters. I do hear they will be back for the next Radio Room and I'll definitely be on the lookout for them. The next Radio Room promises to be crowded too but with more bartenders and satellite bars, the wait should be much less painful. March 4th Marching Band will be there to keep the beat up throughout the night, and perhaps Happillon's amazing oysters will make a show too, so mark Tuesday March 30th on your calendar! A few weeks ago we LA-based bloggers had a nice little get together organized by CarolineOnCrack. 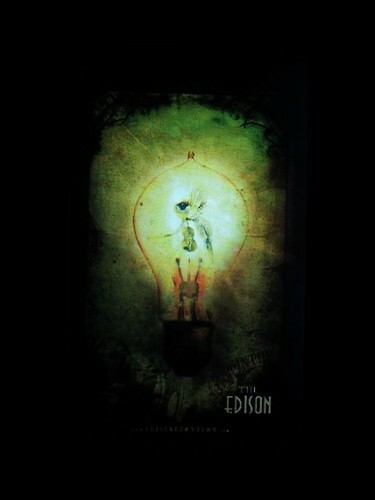 The setting was The Edison Bar in downtown, during one of their Tuesday Speakeasy nights. Everyone else was already there by the time I got there, and were sitting on a long table. The people I managed to talk to on my end of the table included LA&OC Foodie, Joz, travalex, javajunkee, and estarla. I saw their menu online and decided to eat dinner there, but since they are not normally open on Tuesdays they had a limited menu. 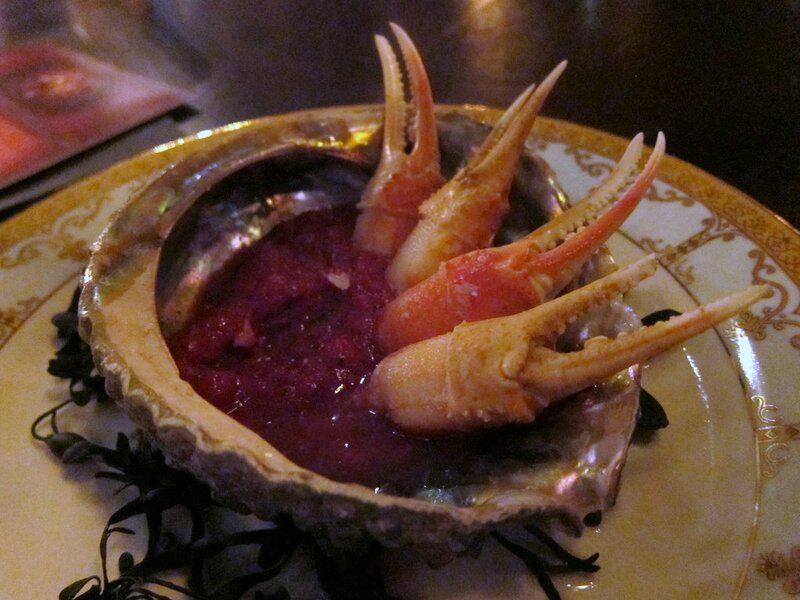 Fortunately though, they still had enough for a real dinner. 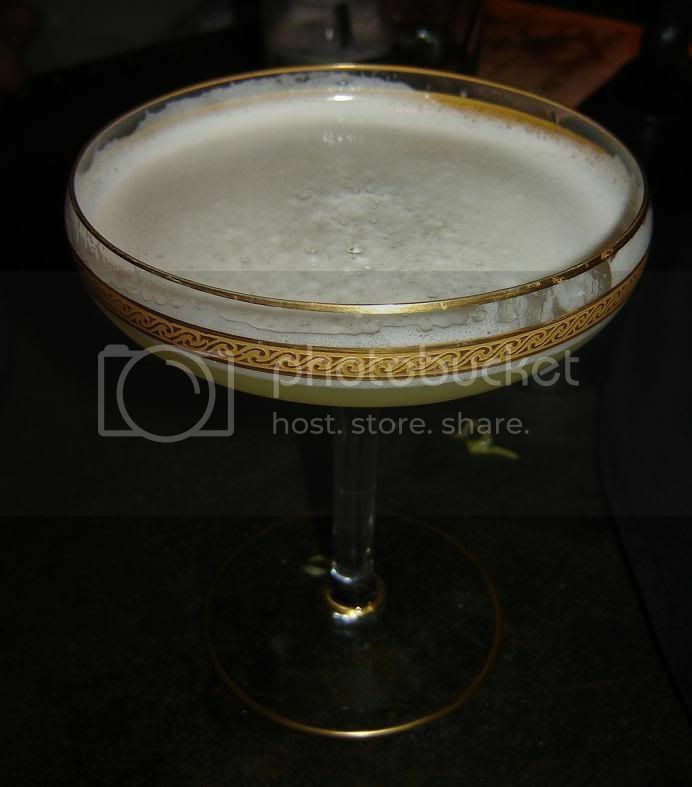 While waiting for the food I started with their Golden Lillet Martini, a strong, yellow, buttery concoction. 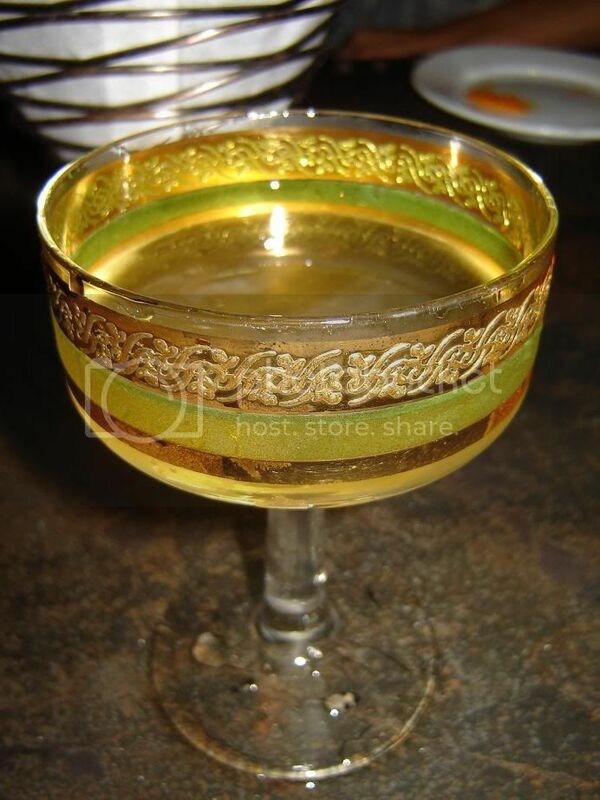 Their cocktails are served in these gorgeous vintage glasses. They're so pretty that I want to put them in my purse, but luckily I was sober enough not to. 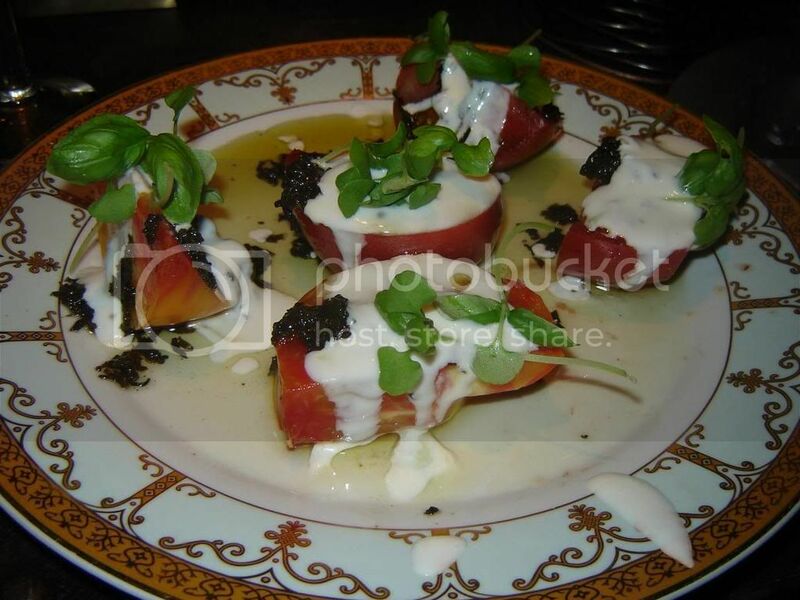 We started with some heirloom tomato salad. 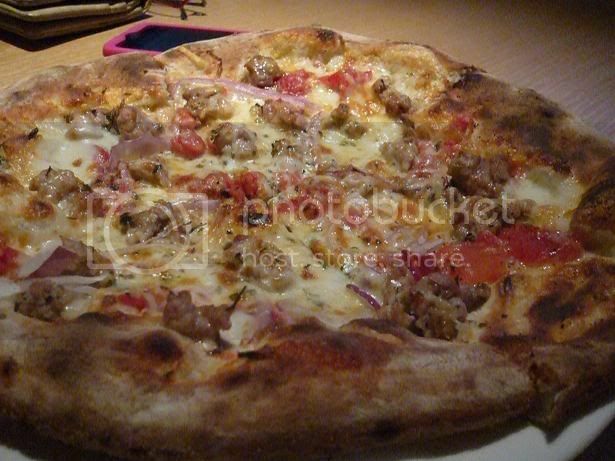 A simple dish that focuses on the nice, fresh tomatoes. 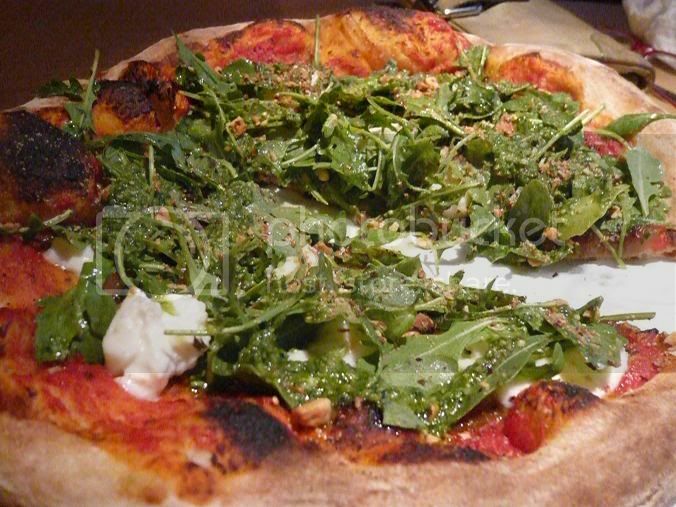 Nice flavor combination with the burrata, baby arugula, and olive oil. 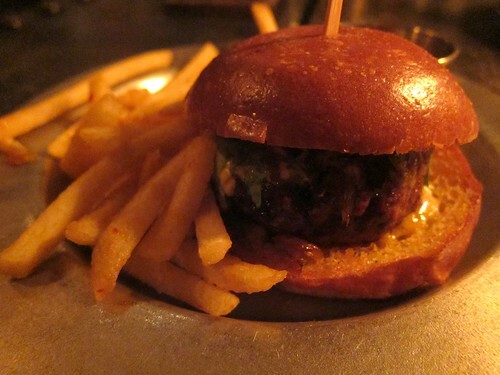 We also had the 20th Century sliders: Kobe beef, arugula, onion marmalade, and blue cheese. There are two sliders in each order. 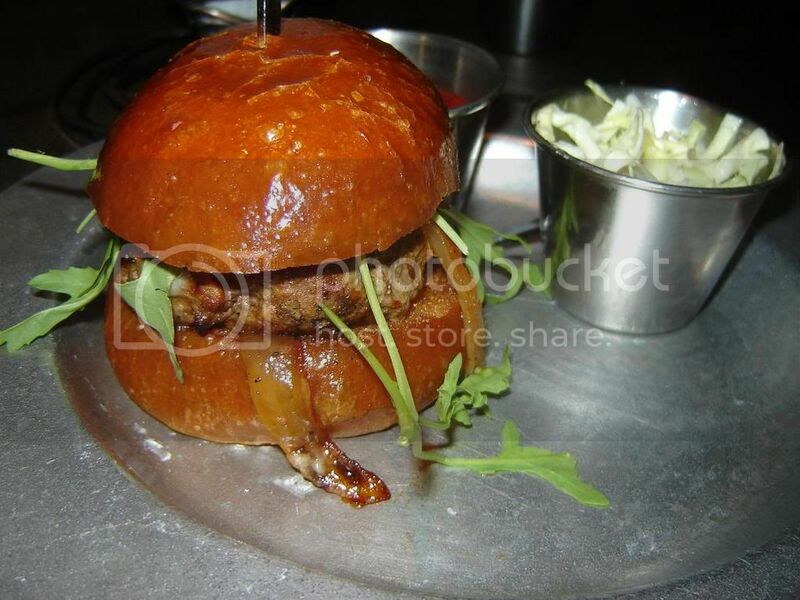 I really liked them - juicy, flavorful patties between delicious buns. They use good ingredients here and it really shows. Also, we all had an order of sweet potato fries to share. I can't remember what else they had food-wise, everyone seemed to order the same things. So. Speakeasy Night. I had heard that there would be cabaret, and the entertainment we got was a pleasant surprise. First there was a lady strutting around in tight leather outfit singing and making jokes in a Russian accent. She also went UP ON our table and danced there! Then they also had a Japanese belly dancer who did a couple of great acts. I thought she was pretty good, and it was quite unique from other belly dancings I've seen (in Moroccan restaurants). There was also a magician who performed some fun tricks involving an audience. 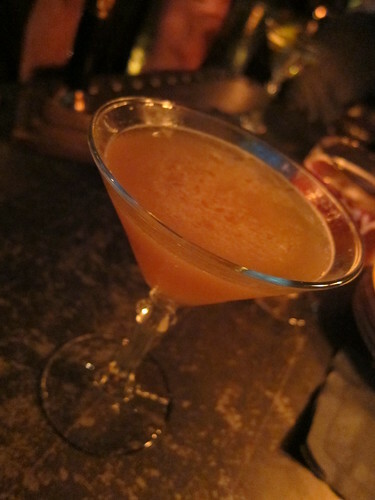 Towards the end of the night, I scored a sip of the Pisco Punch from a FoodDigger. 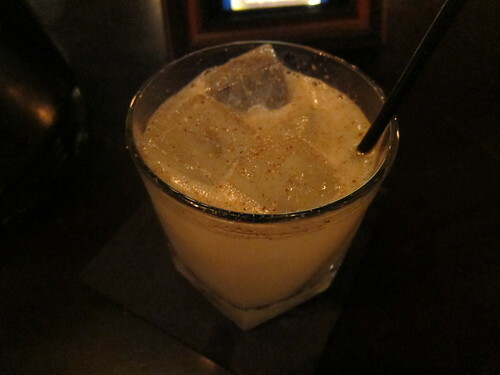 This drink contains Pisco, pineapple juice, and a bit of the green fairy (absinthe). Amazing drink. I wish I had ordered this earlier on. Not overly sweet but goes smoothly and was just delicioussss. Drinks were $14 so not cheap, but I was really happy with my experience there. I am scared of the weekend crowd, but I will definitely be back for some food and drinks, and perhaps even some unique entertainment! Savor the Season this past Sunday marks the end of summer for me and it was a great ending although I stuffed myself silly! A charity event benefiting Break The Cycle - to end domestic violence - Savor the Season features a great lineup of restaurants+more, silent and live auctions throughout the night! It was held at the Vibiana cathedral in downtown LA, a charming little place and a nice garden. 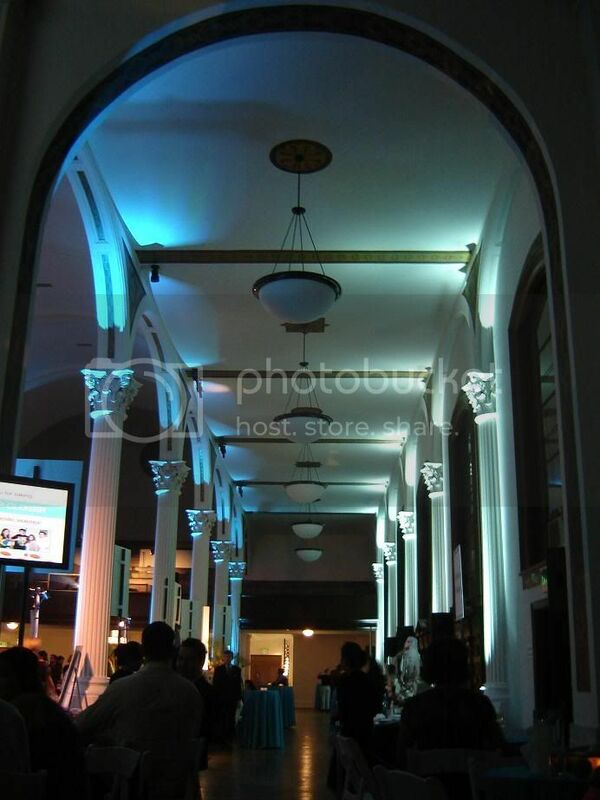 The arches were also beautiful as the night progresses, especially with the lighting that they've set up. Our only problem with it is that it wasn't air conditioned. Although it didn't get stifling hot, we definitely did not wear the sweaters/jackets we had brought along. I got there pretty early so I was able to start grabbing food without a long line. 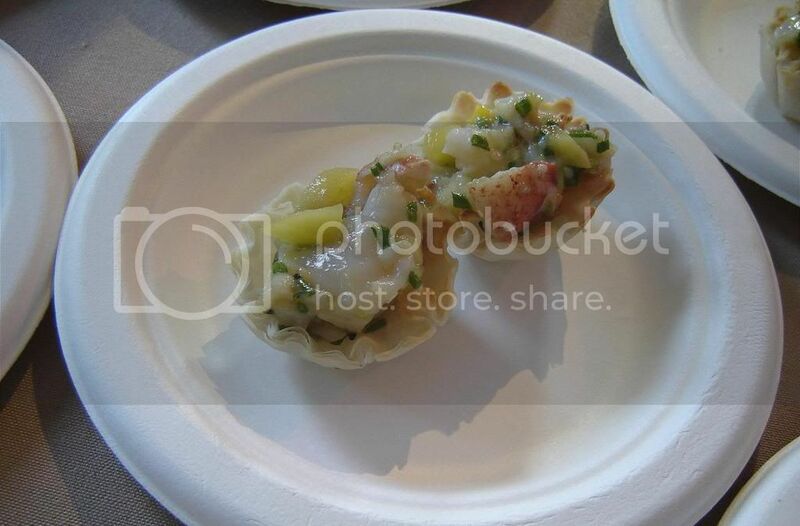 First thing I grabbed was the raw lobster salad in Filo cups from Geoffrey's. I had 2 pounds of lobster the day before but lobster is still good for me anyday! Cocktails for the night were provided by The Edison. They were offering two ginger beer-based drinks: English Afterthought (below) and Dark and Stormy. 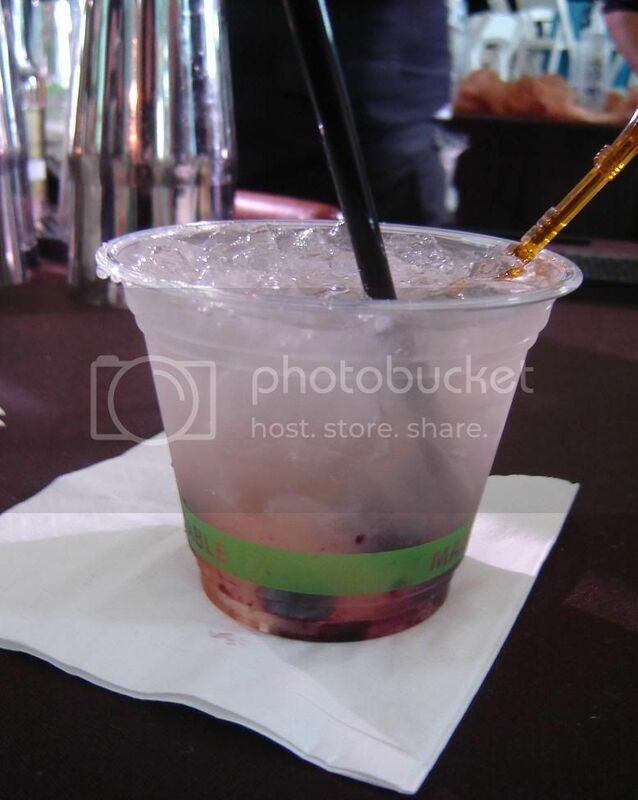 Muddled fresh blueberries+ginger - not too sweet but deliciously refreshing! They also had this gorgeous green fairy pushing the absinthe cart around (partly to promote their Lucent Dossier on Wednesdays). 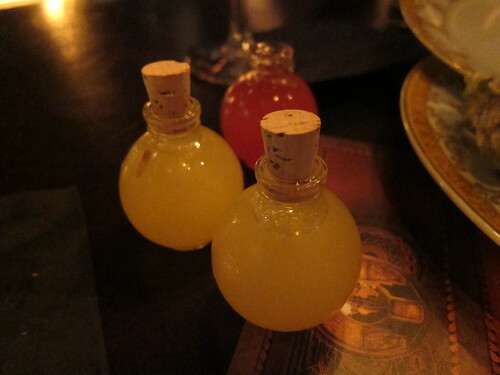 They were giving miniature bottles of absinthe and also some absinthe chocolate made by Madame Chocolat (more on her later). 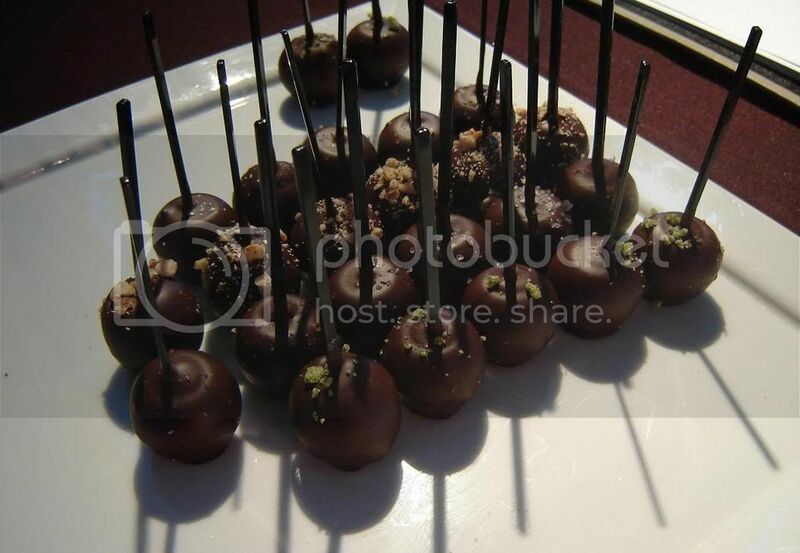 Both Jer-ne from the Ritz in Marina and Brix@1601 were offering trufflepops and both were offering a spicy flavor as part of it. Below are the ones from Brix@1601. They had a mango-chili flavor that was nicely spiced. 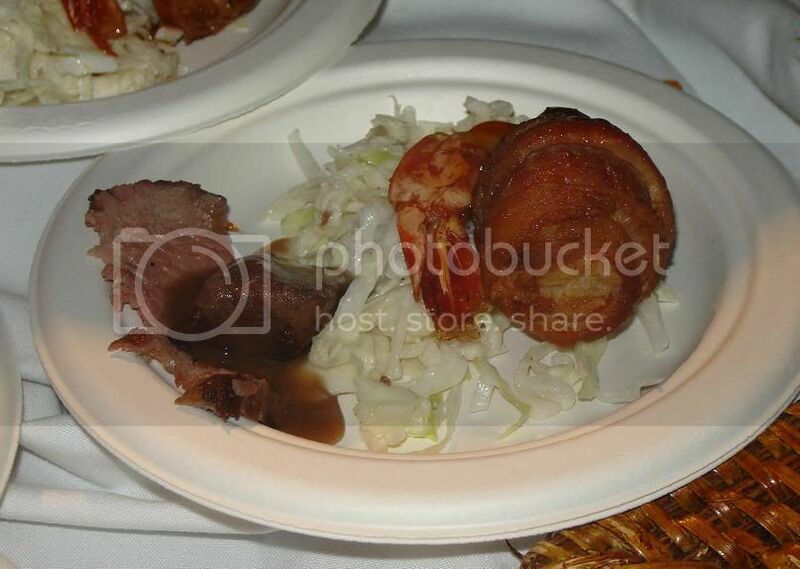 Bacon-wrapped stuffed shrimp and Brant Beef from Salt Creek Grille. Pretty nice and flavorful although the beef is cold by this point. 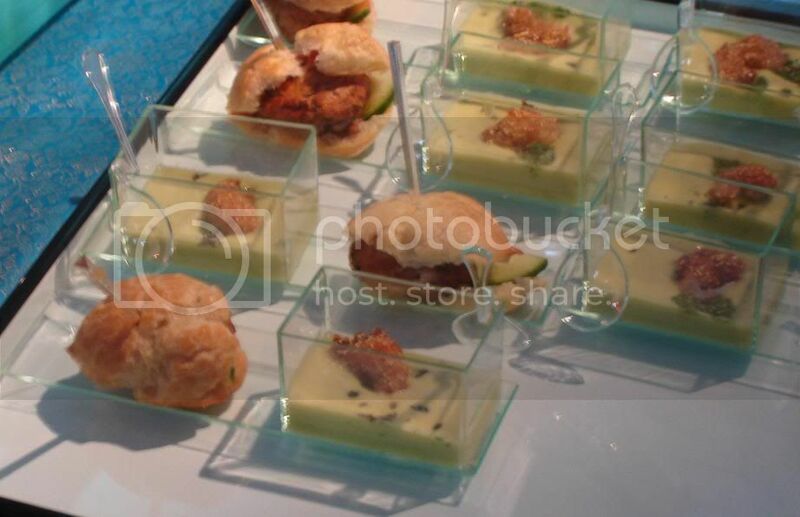 The avocado bisque and chicken tandoori croquette from Catering by Field. 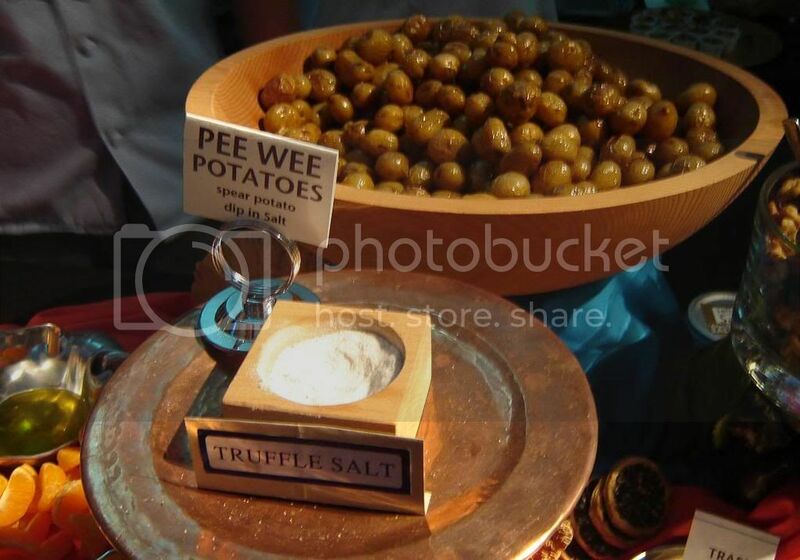 I thought this catering company did a great job - the presentation of these two items were probably the best of the night (besides the green fairy cart!) What cute little plastic dishes. Other dishes that I really liked were the Fried Mac n' Cheese Fritters from Boneyard Bistro. Fried cheesy goodness! Mmm . I thought it would be too fatty and overbearing but it was not so. Liked it a lot. It would be a very addicting snack. They also had lemongrass and lavender soda from Dry Soda, a fairly new soda company. Their sodas are not that sweet so it's really nice and refreshing! Right when you walk in you will see Saltistry's booth, featuring a nice variety of flavored salts and fruits/veggies to dip into it. My favorite is this one, and I'm sure you can imagine why! 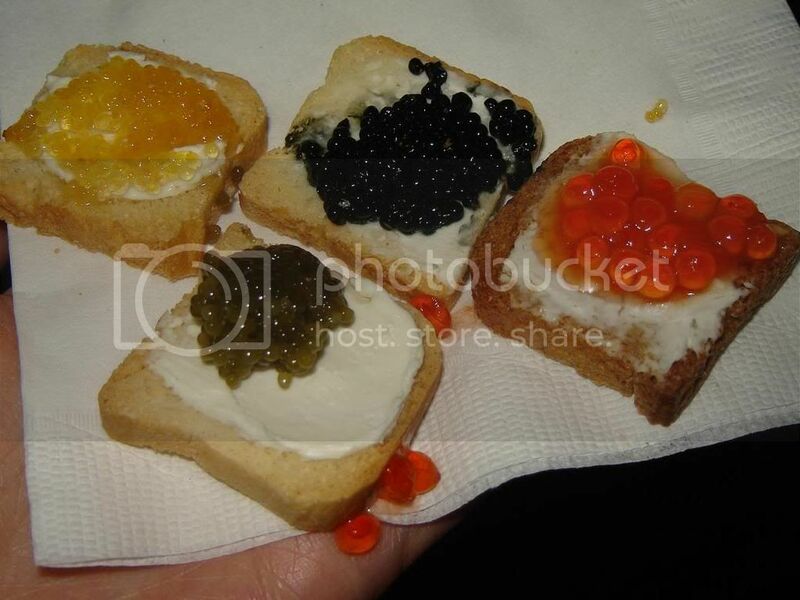 They were very busy replenishing the tray and couldn't tell us what each individual piece was, but in the end I still like the salmon roe the best. Also in the VIP section was a great cheese booth from Andrew's Cheese Company who were giving out cards about the different cheeses. Besides champagne, they of course had to have chocolates! 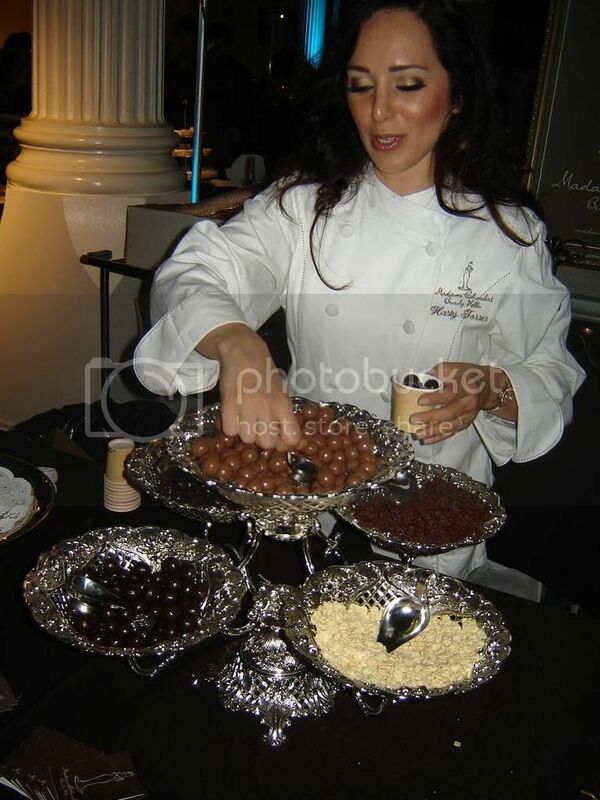 Madame Chocolat was giving out dark/milk chocolate malt balls, chocolate covered cornflakes. She had other things that apparently had run out by the time we got there. Tutti Gelati had a gelato booth and had a nice combination of dark chocolate, strawberries, and balsamic vinegar. They also had a very nice limoncello made with venutra lemons from Ventura Limoncello Company. Stronger than other limoncellos I had, but very delicious! These are all little tastes but *sigh* it really added up and after a while I couldn't remain standing. I had to sit down and rest my stomach for a bit. Other bloggers including LA&OC Foodie, CarolineOnCrack, and EatingLA were there and I think I can safely say we all stuffed ourselves! Luckily for us we managed to go into the VIP section where they had tables and chairs - the main dining room did not which was rather a bummer for people in high heels like I was! But it was such a great event, and benefiting a great cause too! I would definitely keep this event in mind for next year also! 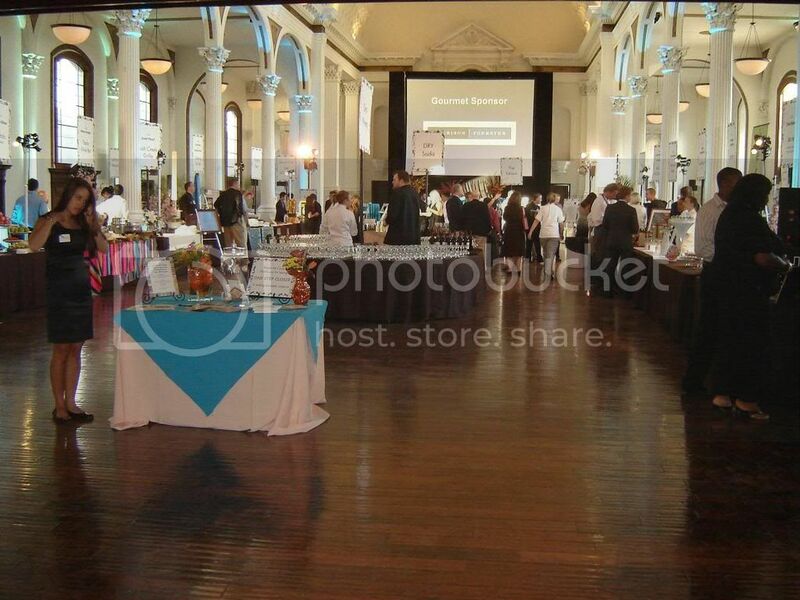 I tried bidding on the silent auction, although I didn't win anything. We all had fun and great food and drinks.